UniVest® extruder insulation jackets are a low cost way to dramatically reduce your energy bills and promote employee protection. Our UniVest® jackets for extruders are designed to best fit an array of sizes and to ensure the jackets will not be in the way of your process. Extruder insulation jackets use straps and roller buckles and with magnets to fit all hot parts of your equipment from extruder barrel to feed pipes to the dies themselves, we insulate it all. 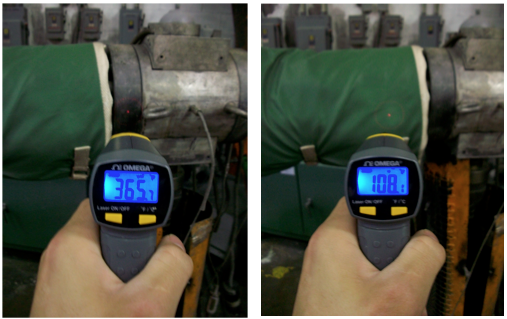 Most metal shrouds reach temperatures above 300ºF. It is every manufacturing facilities duty to protect their employees. UniVest insulation jackets are the safest and easiest way to protect your employees from injury. Extruder insulation jackets can cut energy bills, thereby saving machine process electricity. In addition to saving energy, the reduction of heat loss will improve ambient work environment temperatures, increasing employee productivity and positive attitude. 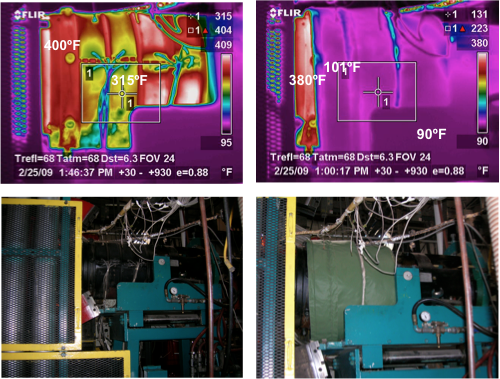 Use UniVest® Throwblankets to drape your extrusion machines.